Fill out your postcard and return it to your nearest OPSEU regional office by March 3. 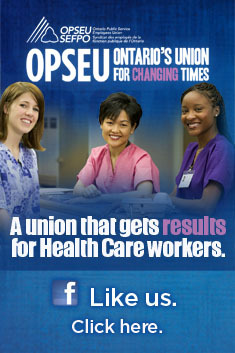 This week postcards are being distributed to OPSEU’s regional offices. 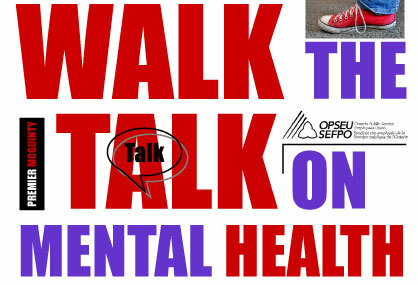 The postcards ask Dalton McGuinty to “walk the talk” on mental health. The Ontario government has spent the last two-and-a-half years developing their 10-year strategy for improving mental health. This has been against a backdrop of fiscal restraint that has resulted in cuts to front line jobs caring for Ontarians with mental illness. Instead of making every door the right door, front line workers are telling us that the doors are simply closing. Their ability to provide real care, comfort and assistance to adults, youth and children with mental illness has been seriously jeopardized. OPSEU Locals are being asked to pick up the cards they need from their regional office and return them to these offices by March 3rd. The postcards will then be sent to Toronto for a press conference and presentation on March 8th. Ontario spends far less on mental health than most comparable international jurisdictions. Recently layoffs have taken place at Toronto’s Centre for Addictions and Mental Health (CAMH), Ontario Shores Centre for Mental Health Sciences, and Regional Mental Health Centre – London and St. Thomas. Services have also been transferred out of North Bay and Brockville. The Salvation Army recently announced it was closing down its transition program in the west end of Toronto, although the decision has been placed on hold until the SA can appear before the Local Health Integration Network. A recent Toronto Star story highlighted how CAMH’s schizophrenic unit was transferring to a building with a long history of criminal activity. One CAMH client described the building as infested with bed bugs. Health Minister Deb Matthews has committed to releasing the final 10-year plan for mental health this spring.